This is “Pakistan and Bangladesh”, section 9.3 from the book Regional Geography of the World: Globalization, People, and Places (v. 1.0). For details on it (including licensing), click here. Outline how Pakistan and Bangladesh are similar in their populations and economic dynamics but different in their physical environments. Understand why the two countries were once under the same government and separated in 1972, when East Pakistan became Bangladesh. Describe the various regions of Pakistan and their physical and cultural landscapes. Comprehend the impact that large populations have on the natural environment and outline the main environmental issues that confront these two countries. Pakistan and Bangladesh are two separate and independent countries physically divided by India. Historically, this was not always the case: from 1947 to 1971 they were administered under the same government. The two countries share a number of attributes. They both have Muslim majorities and both have high population densities. The countries are two of the top ten most populous countries in the world. Their populations are youthful and mainly rural; agriculture is the main economic activity in each country. Rural-to-urban shift is a major trend affecting urban development. Infrastructure is lacking in many areas of each country. These similar factors indicate that both Pakistan and Bangladesh will face comparable challenges in providing for their large populations and protecting their natural environments. The Muslim League was responsible for the formation of a united Pakistan, a predominantly Muslim state for South Asian Muslims. Pakistan was created from the former Indian territories of Sindh (Sind), North West Frontier Provinces, West Punjab, Baluchistan, and East Bengal. Pakistan was formed with two separate physical regions, defined by religious predominance. East Bengal, on the eastern side of India, was known as East Pakistan, while the remainder, separated by more than one thousand miles, was known as West Pakistan. The two physical units were united politically. East and West Pakistan, administered by one government, became independent of their colonial master in 1947, when Britain was forced out. Pakistan (East and West) adopted its constitution in 1956 and became an Islamic republic. In 1970, a massive cyclone hit the coast of East Pakistan and the central government in West Pakistan responded weakly to the devastation. The Bengali populations were angered over the government’s lack of consideration for them in response to the cyclone and in other matters. The Indo-Pakistan War changed the situation. In this war, East Pakistan, with the aid of the Indian military, challenged West Pakistan and declared independence to become Bangladesh in 1972. West Pakistan became the current country of Pakistan. The physical area of Pakistan is equivalent to the US states of Texas and Louisiana combined. Much of Pakistan’s land area comprises either deserts or mountains. The high Himalayan ranges border Pakistan to the north. The lack of rainfall in the western part of the country restricts agricultural production in the mountain valleys and near the river basins. The Indus River flows roughly northeast/southwest along the eastern side of Pakistan, flowing into the Arabian Sea. River sediments are deposited in large areas found between river channels and oxbow lakes formed from the constantly changing river channels. 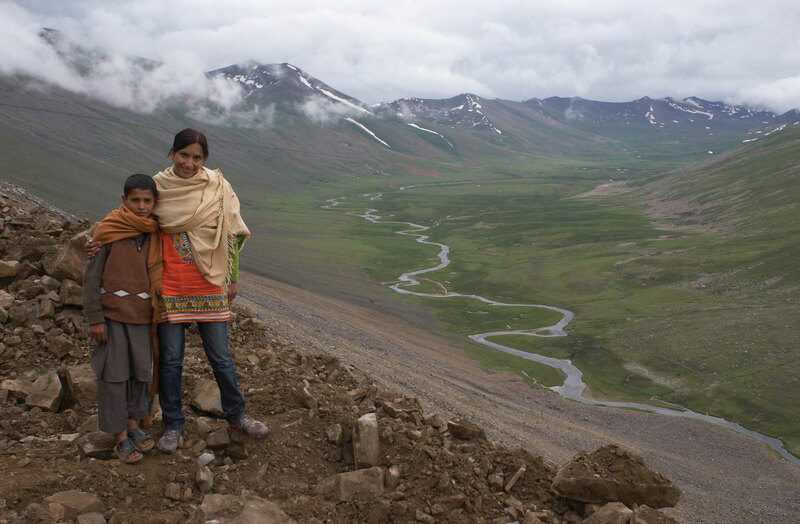 These “lands between the rivers” are called “doabsSilt deposits formed by changing river channels along the Indus River in Pakistan.” and represent some of the most fertile land in the Indian subcontinent. The Indus River flows from the northern part of the Karakoram mountains and creates a large, fertile flood plain that comprises much of eastern Pakistan. Pakistan has traditionally been a land of farming. The Indus River Valley and the Punjab are the dominant core areas where most of the people live and where population densities are remarkably high. The two core areas of Pakistan are the Punjab and the Indus River Valley. Approximately 64 percent of the population lives in rural areas and makes a living in agriculture. Most of the people are economically quite poor by world standards. In spite of the rural nature of the population, the average family size has decreased from seven to four in recent decades. Nevertheless, the population has exploded from about 34 million in 1951 to about 187 million as of 2011. About half of the population is under the age of twenty; 35 percent is under the age of fifteen. 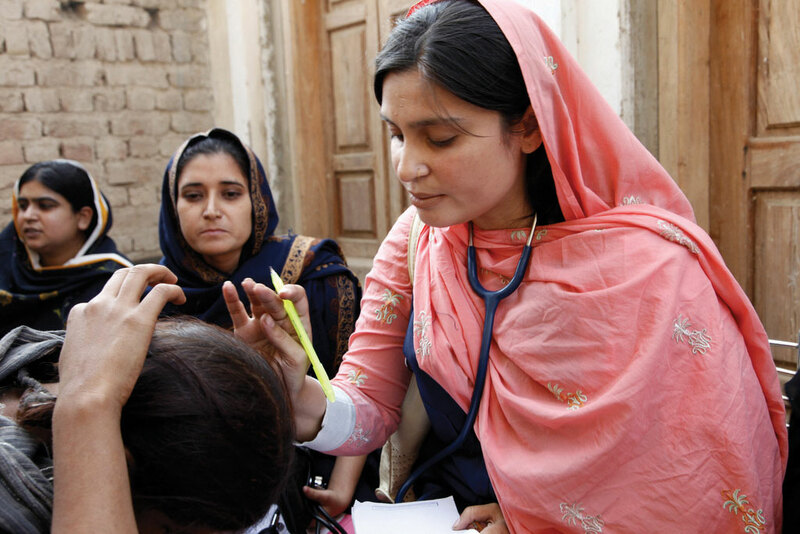 A lack of adequate medical care, an absence of family planning, and the low status of women have created an ever-increasing population, which will have dire consequences for the future of Pakistan. Service and infrastructure to address the needs of this youthful population are not available to the necessary degree. Schools and educational opportunities for children are rarely funded at the needed levels. As of 2010, only about 50 percent of Pakistan’s population was literate. Source: Updated from map courtesy of Schajee, http://commons.wikimedia.org/wiki/File:PAK_AU_T1.svg. The capital of Pakistan when it was under British colonialism was Karachi, a port city located on the Arabian Sea. To establish a presence in the north, near Kashmir, the capital was moved to Islamabad in 1960. This example of a forward capital was an expression of geopolitical assertiveness by Pakistan against India. The lingua franca of the country for the business sector and the social elite continues to be English, even though Urdu is considered the national language of Pakistan and is used as a lingua franca in many areas. More than sixty languages are spoken in the country. There are as many ethnic groups in Pakistan as there are languages. The three most prominent ethnic groups are Punjabis, Pashtuns, and Sindhis. The three main physical geographic regions of Pakistan are the Indus River Basin, the Baluchistan Plateau, and the northern highlands. These physical regions are generally associated with the country’s main political provinces. 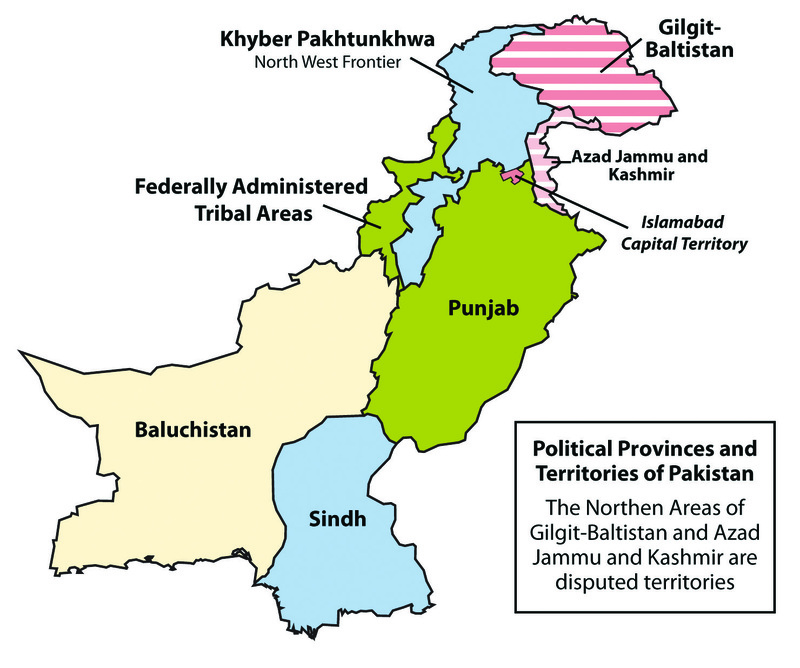 The four main provinces include the Punjab, Baluchistan (Balochistan), Sindh (Sind), and Khyber Pakhtunkhwa (North West Frontier). To the north is the disputed region of Kashmir known as the Northern Areas. Each of these regions represents a different aspect of the country. The North West Frontier has a series of Tribal Areas bordering Afghanistan that have been traditionally under their own local control. Agents under Tribal Agencies have attempted to administer some type of structure and responsibility for the areas, with little success. This is an example of traditional transportation mixing with modern technology. 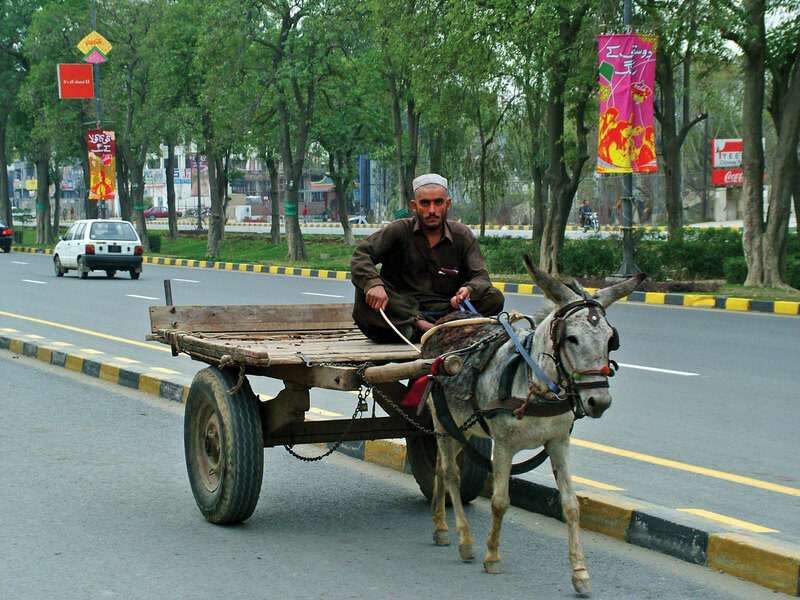 Lahore is a large city with a wide range of methods of conducting business. Source: Photo courtesy of Guilhem Vellut, http://www.flickr.com/photos/o_0/10070267. As explained previously, the Punjab is a core area of Pakistan, and has about 60 percent of Pakistan’s population. The five rivers of the Punjab border India and provide the fresh water necessary to grow food to support a large population. Irrigation canals create a water management network that provides water throughout the region. 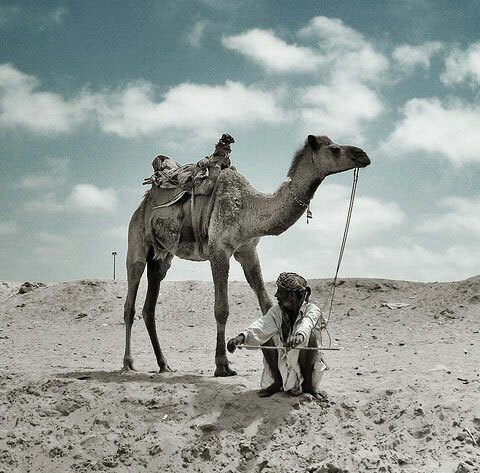 The southern portion of the Punjab includes the arid conditions of the Thar Desert. The northern sector includes the foothills of the mountains and has cooler temperatures in the higher elevations. The Punjab is anchored by the cities of Lahore, Faisalabad, and Multan. Lahore is the cultural center of Pakistan and is home to the University of the Punjab and many magnificent mosques and palaces built during its early history. In the 1980s, many Punjabis migrated to Europe, the Middle East, and North America seeking opportunities and employment. This diaspora of people from the Punjab provided cultural and business ties with Pakistan. For example, trade connections between the Punjab and the United States are increasing. The Punjab is the most industrialized of all the provinces. Manufacturing has increased with industries producing everything from vehicles to electrical appliances to textiles. The industrialization of the Punjab is an indication of its skilled work force and the highest literacy rate in Pakistan, at about 80 percent. Source: Photo courtesy of Kashif Muhammad Farooq, http://www.flickr.com/photos/kashiff/2592800506. Baluchistan (Balochistan) encompasses a large portion of southwest Pakistan to the west of the Indus River. The region connects the Middle East and Iran with the rest of Asia. The landscape consists of barren terrain, sandy deserts, and rocky surfaces. Baluchistan covers about 44 percent of the entire country and is the largest political unit. The sparse population ekes a living out of the few mountain valleys where water can be found. Local politics provides the basic structure for society in this region. Within the Baluchistan province of Pakistan are several coastal and interior rivers; the interior rivers flow from the Hindu Kush Mountains of Afghanistan, while most of the rivers along the coastal deserts from west of Karachi to the Iranian border are seasonal in nature and provide one of the few sources of fresh water in those coastal regions. Much of the coastal region is arid desert with sand dunes and large volcanic mountainous features. The Sindh (Sind) region of the southeast is anchored by Karachi, Pakistan’s largest city and major port. The Indus River is the border on the west and the Punjab region lies to the north. To the east of the Sindh is the border with India and the great Thar Desert. The Sindh is a region that misses out on the rains from the summer monsoon and the retreating monsoon season, when the winds sweep in from the north over South Asia. 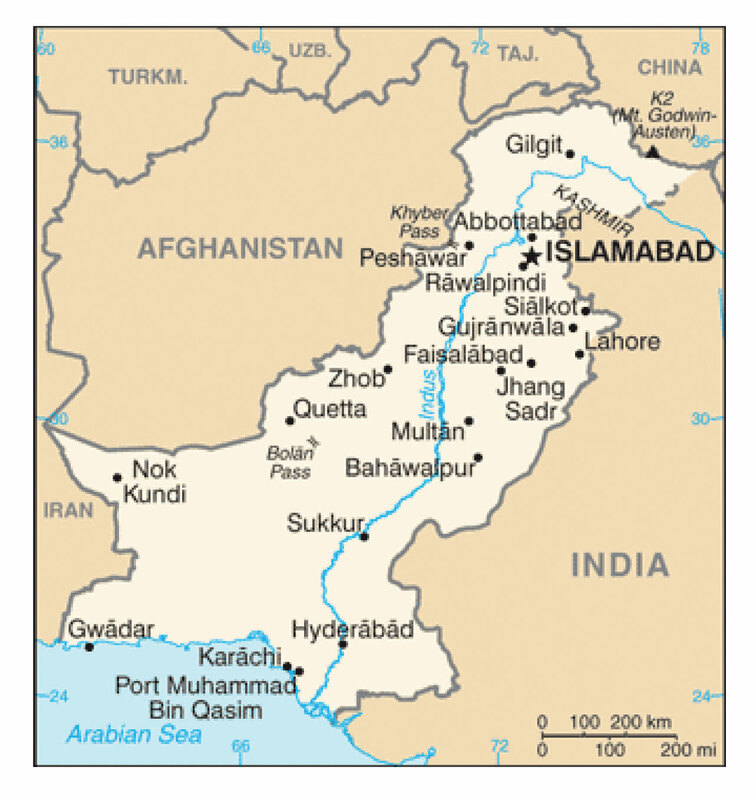 The city of Hyderabad, Pakistan, is located along the Indus River, which is a key food-growing area. Food crops consist of wheat and other small grains, with cotton as a major cash crop that helps support the textile industry of the region. Hyderabad, Pakistan, is not to be confused with a large city with the same name in India. Source: Photo courtesy of UK Department for International Development, http://www.flickr.com/photos/dfid/5331065350. Rural-to-urban shift has pushed large numbers of Sindh residents into the city of Karachi to look for opportunities and employment. In previous sections, slums and shantytowns have been described and explained for cities such as Mexico City and São Paulo; Karachi has similar development patterns. The central business district has a thriving business sector that anchors the southern part of the country. The city has a large port facility on the Arabian Sea. As a city of twelve to fifteen million people or more, there are always problems with a lack of public services, law enforcement, or adequate infrastructure. Urban centers usually have a strong informal economy that provides a means for many of the citizens to get by but is outside the control of the city or national government. The Sindh is the second-most populous region of Pakistan, after the Punjab. Source: Photo courtesy of Kai Hendry, http://www.flickr.com/photos/hendry/73370895. The North West Frontier is a broad expanse of territory that extends from the northern edge of Baluchistan to the Northern Areas of the former Kingdom of Kashmir. Sandwiched between the tribal areas along the Afghanistan border and the well-watered lands of the Punjab, the Khyber Pakhtunkhwa Province is dominated by remote mountain ranges with fertile valleys. The famous Khyber Pass, a major chokepoint into Afghanistan, is located here. The frontier is a breeding ground for anti-Western culture and anti-American sentiments, mainly fueled by the US military activity in Afghanistan. The Taliban movement that once controlled the government of Afghanistan has been active and generally more organized in this region than in Afghanistan. A push for more fundamentalist Islamic law has been a major initiative of the local leaders. Support for education and modernization is minimal. The government of Pakistan has also stepped up its military actions in the region to counter the activities of the militant Islamic extremists. The North West Frontier borders the Tribal Areas, where clans and local leaders are standard parts of the sociopolitical structure. These remote areas have seldom been fully controlled by either the colonial governments (the British) or the current government of Pakistan. There are about seven main areas that fall under this description. Accountability for the areas has been difficult and even when the national government stepped in to exercise authority, there was serious resistance that halted any real established interaction. These remote areas are where groups such as al-Qaeda and the Taliban often find safe haven. South and North Waziristan are two of the main areas that have been controlled by Tribal Agencies and not directly by the Pakistani government. Pakistan’s Northern Areas include the territories that were once part of the Kingdom of Kashmir, the boundaries of which are disputed with India. The region is, in other words, interconnected with the issues related to Kashmir that involve Pakistan, India, and China. There are two main political entities: the large northern section bordering Afghanistan is called Gilgit-Baltistan, and the narrow section near Islamabad is called Azad Kashmir (Azad Jammu and Kashmir). The Northern Areas are highlands, bordered to the north by the towering Karakoram and Pamir mountain ranges. K2, the world’s second highest mountain, which reaches 28,250 feet, is located here. The Northern Areas are sparsely populated except for the Indus River valley. The conflicts over these territories fuel nationalistic forces in both Pakistan and India. The conflicts are as much between Islam and Hinduism as they are between political factions. The early war between India and Pakistan over the border that the British placed between them in 1947 almost seems to be reenacted in the more recent conflicts over the region of Kashmir. Source: Photo courtesy of Tore Urnes, http://www.flickr.com/photos/urnes/2663083945. Today most of the people living in Pakistan are Muslim. About 85 percent of the Muslim population in Pakistan is Sunni and about 15 percent of the Muslim population is Shia, which is consistent with the percentages of the two Islamic divisions worldwide. Islam is considered the state religion of Pakistan. The state is a federal republic with a parliamentarian style of government. As an Islamic state following the Sharia laws of the Koran, it has been a challenge for Pakistan to try to balance instituting democratic reforms while staying true to fundamental Islamic teachings. Pakistan has held elections for government leaders, and the status of women has improved. Women have held many governmental and political positions, including prime minister. The military has been a foundation of power for those in charge. As a result of weak economic conditions throughout the country, it has been the military that has received primary attention and is the strongest institution within the government. Pakistan has demonstrated its nuclear weapons capability in recent years, which established it as a major player in regional affairs. Pakistan has suffered from inadequate funding for public schools. As a rule, the wealthy urban elites have been the only families who could afford to send their children to college. With half the population consisting of young people, there are few opportunities to look forward to in Pakistan. Education has been supported in the form of Islamic religious schools called madrassasPrivate religious schools that teach the Koran and Islamic Law., which teach children the Koran and Islamic law. Much of the funding for religious schools comes from outside sources such as Saudi Arabia. The result is a religious education that does not provide the skills needed for the modern world. Pakistan has worked to build schools, colleges, and universities to educate its people. The situation is that population growth has been outpacing what little budget was allocated for educational purposes. The government of Pakistan has struggled to meet the challenge posed by the democratic structure of its constitution. The combination of a federal republic and an Islamic state creates a unique and at times difficult balance in administrative politics. The legislative body of Pakistan consists of a National Assembly and a Senate. The leader of the National Assembly is the prime minister. The elected president not only is in charge of the military but is also head of state. The military establishment and the Inter-Services Intelligence (ISI) agency hold major political power in Pakistan. The political leadership has often vacillated between military and civilian rule. Transitions between the two types of leadership have been conducted through civil unrest or political demonstrations in the streets. Women’s roles in Pakistani leadership have been complex. To understand the impact of electing the first woman prime minister in Pakistan, one has to go back to 1972. At that time, East Pakistan gained its independence and changed its name to Bangladesh. At roughly the same time, Pakistan elected President Zulfikar Ali Bhutto to power. After ruling for five years, Zulfikar Ali Bhutto was ousted from power and sentenced to death by General Zia, who became the next president. General Zia was the first military general to also be president. He allowed the Islamic Sharia law to be introduced into the legal system, which bolstered the influence of Islam on the military and government services. In 1988, General Zia was killed in an unexplained plane crash. The daughter of the first president—Zulfikar Ali Bhutto—was then elected as prime minister. The thirty-five-year-old Benazir Bhutto was the first female prime minister of Pakistan. Benazir Bhutto’s tenure as prime minister was short-lived. After a year and a half, the president removed her from office on accusations of corruption. She ran again in 1993 and was reelected to the prime minister position. Charges of corruption continued and she was removed as prime minister a second time in 1996. Political corruption, or the accusations of such a charge, is not uncommon in Pakistan or other countries with volatile political situations. To keep from being prosecuted by her opposition, Benazir Bhutto left Pakistan in 1998 and lived in Dubai. She did not return to Pakistan until 2007, under an agreement reached with the military general who was president at the time, General Pervez Musharraf. Benazir Bhutto was given amnesty for any and all claims against her. 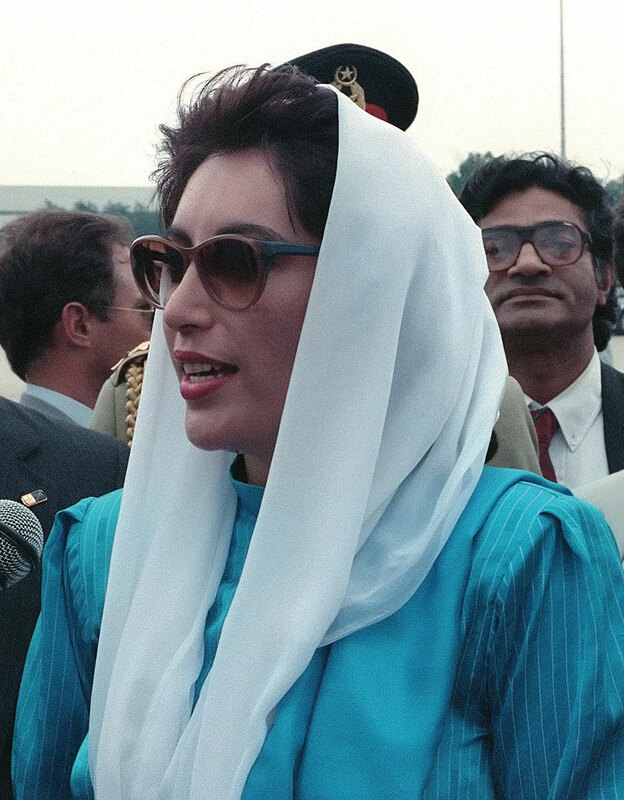 Benazir Bhutto visits the United States in 1989 while she was the prime minister of Pakistan. Source: Photo courtesy of SRA Gerald B. Johnson, US Department of Defense, http://commons.wikimedia.org/wiki/File:Benazir_bhutto_1988.jpg. The elimination of the corruption charges against her allowed Benazir Bhutto to become a candidate for the office of president. She organized an effective campaign. Her campaign for the presidency energized the political landscape of the country. In December of 2007, her campaign was cut short. Benazir Bhutto was assassinated after departing a political rally. She was assassinated a few weeks before the polls were to open for the election. Benazir Bhutto was the leading opposition candidate. Her death rallied support against General Musharraf with continued calls for his removal from office. General Musharraf resigned from the presidency in 2008. The winner of the presidential elections that followed was none other than Benazir Bhutto’s husband, Asif Ali Zardari. 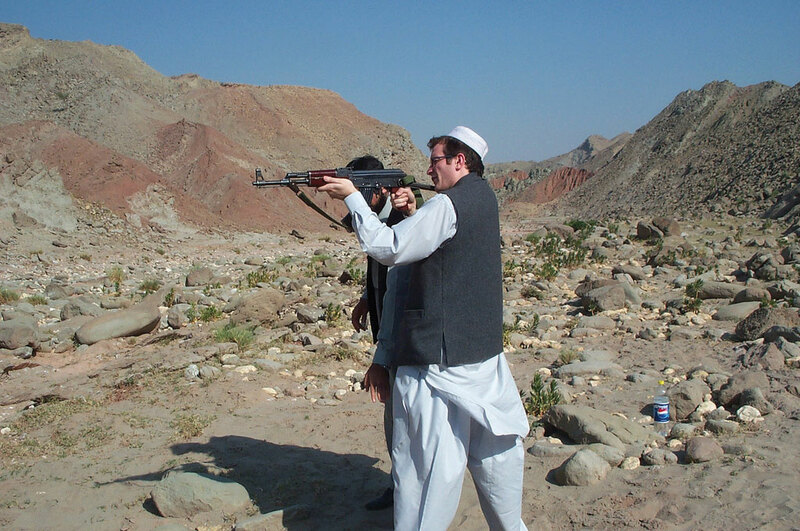 President Zardari blamed the Taliban for the assassination of his wife. Pakistan is confronted with severe environmental issues. One of the concerns is a fault zone that runs directly through the region. Pakistan’s regions are divided by the Eurasian tectonic plate and the Indian tectonic plate. Shifting tectonic plates cause earthquakes; there have been several major ones in Pakistan’s recent history. For instance, an earthquake of 7.6 magnitude in 2005 in the northern region of the North West Frontier claimed about eighty-nine thousand lives in Pakistan and a few thousand others in neighboring India and Afghanistan. About 150 aftershocks were felt the next day, many of which were over the 6.0 level on the Richter scale. This particular event in 2005 was listed as the fourteenth most devastating earthquake on record at the time. It left over three million people without a home in Pakistan alone and more people were left homeless in neighboring areas. Hardest hit outside of Pakistan was the portion of Kashmir that is controlled by India. Many countries, including the United States, stepped up and supported the aid effort to reach people in the devastated region. Major earthquakes that cause devastation for the large populations here are common along this tectonic plate boundary. Another environmental issue in Pakistan is water pollution. Raw sewage discharges into the rivers and streams and contaminates the drinking water for many Pakistanis. Most of the population lives in rural areas and relies on natural untreated water for their consumption. The water sources are heavily polluted, triggering disease and health problems. The urban areas lack public water works to handle fresh water supplies or to dispose of sewage properly. Industrial wastes and agricultural runoff also pollute and damage water supplies. Floods and natural runoff can carry pollutants from the land or urban areas into the rivers and streams that are used by human communities. The net effect of all these factors is that a majority of Pakistan’s population lacks safe drinking water. 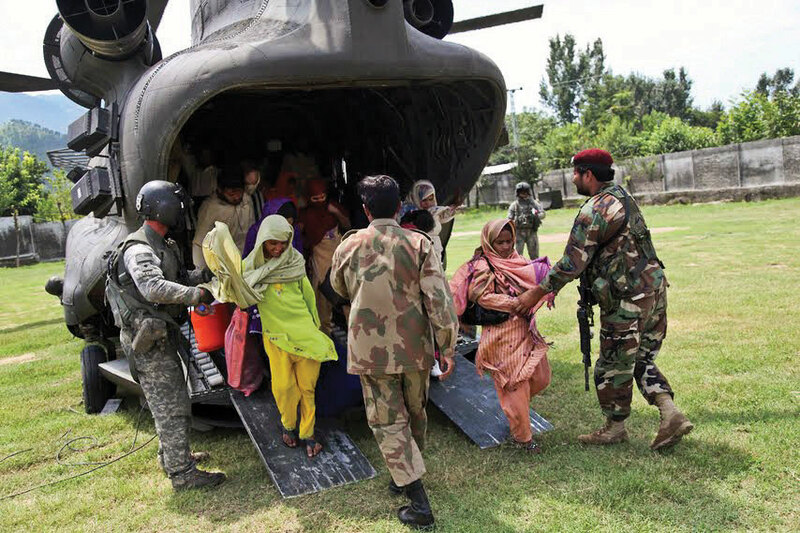 A US Army soldier and Pakistani troops help Pakistani residents as they disembark from a US Army helicopter in Khwazahkela, Pakistan, as part of relief efforts to help flood victims on August 5, 2010. Heavy rains forced thousands of residents to flee rising flood waters. US forces partnered with the Pakistani military to coordinate evacuation and relief efforts. Source: Photo courtesy of Staff Sgt Horace Murray, US Army, http://www.flickr.com/photos/soldiersmediacenter/4878605031. Deforestation is another environmental problem in Pakistan, because the demand for wood for cooking fuel and building is on the rise. Only about 2.5 percent of Pakistan is forested. In the last two decades, Pakistan has lost about one-fourth of its forest cover. The removal of forests causes widespread soil erosion during heavy rains and decreases natural habitat for organisms and wild animals. Efforts to protect the biodiversity of the country have been minimal and are complicated by the increase in population, which is expected to double in about forty-five years if population growth remains on its current trajectory. The reality is that deforestation is likely to continue in Pakistan, with little hope of a solution anytime soon. Bangladesh is a low-lying country that is associated with the types of marshy environments found in tropical areas and river deltas. The region is extremely prone to flooding, particularly during the monsoon season because of the high amount of rainfall. One of the most important rivers of Bangladesh flows southward from the Himalayas through India and into Bangladesh. While in India, this river is known as the Brahmaputra River, but when it enters Bangladesh, it is known as the Jamuna River. It provides a major waterway for this region and empties into the Bay of Bengal. Bangladesh has about the same geographical area as the US state of Wisconsin. Bangladesh’s population estimate in 2011 was 158 million; Wisconsin’s was about 5.6 million. Contributing to the immense flow of water through the country are the Ganges and the Meghna rivers, which join up with the Brahmaputra River near the sea. The Ganges flows through northern India and is a major source of fresh water for a large population before it reaches Bangladesh. The Meghna is a collection of tributaries within the boundaries of Bangladesh that flows out of the eastern part of the country. The Meghna is a deep river that can reach depths of almost two thousand feet with an average depth of more than one thousand feet. The hundreds of water channels throughout the relatively flat country provide for transportation routes for boats and ships that move goods and people from place to place. There are few bridges, so land travel is restricted when rainfall is heavy. Imagine a country the size of the US state of Wisconsin. Now imagine half of the entire population of the United States living within its borders. Welcome to Bangladesh. With an estimated population of about 158 million in 2011 and a land area of only 55,556 square miles, it is one of the most densely populated countries on the planet. Most of the population in Bangladesh is rural, agriculturally grounded, and poor. 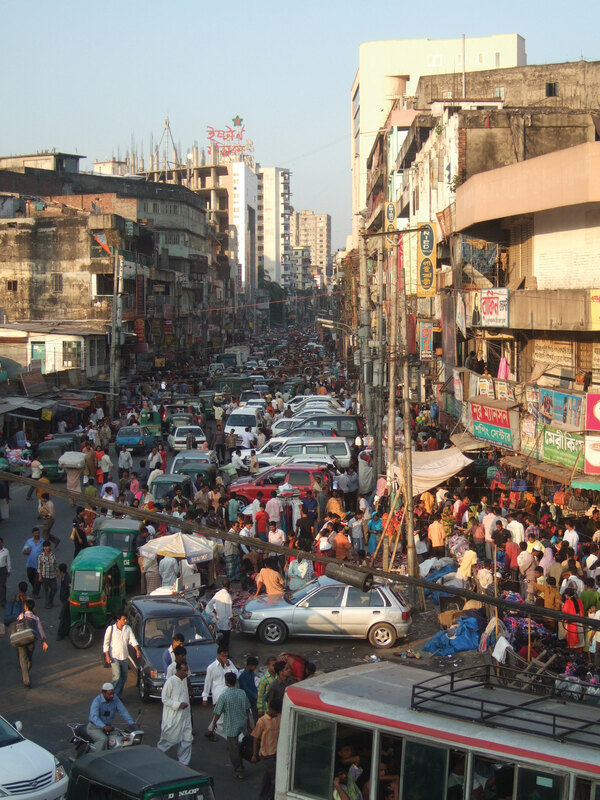 The larger cities, such as the capital of Dhaka, have modern conveniences, complete with Internet cafes, shopping districts, and contemporary goods. The rural areas often suffer from a lack of adequate transportation, infrastructure, and public services. Poverty is common; income levels average the equivalent of a few US dollars per day. Remarkably, the culture remains vibrant and active, pursuing livelihoods that seek out every opportunity or advantage available to them. There are many ethnic groups in Bangladesh, and many languages are spoken. 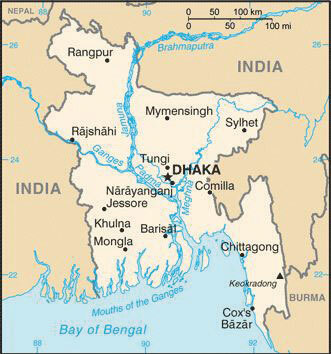 The official and most widely used language in Bangladesh is Bengali (Bengala), which is an Indo-Aryan language of Sanskrit origin and has its own script. A Presidential Order in 1987 made Bengali the official language for the government of Bangladesh. Bengali is also the main language for the Indian state of West Bengal, which neighbors Bangladesh. English is used as the lingua franca among the middle and upper classes and in higher education. Many minor languages are spoken in Bangladesh and in the region as a whole. Most of the population, about 90 percent, is Muslim, with all but about 3 percent Sunni. There is a sizable minority, about 9 percent, which adheres to Hinduism, Buddhism, Christianity, or animism. The US State Department considers Bangladesh to be a moderate Islamic democratic country. Source: Photo courtesy of Ben Sutherland, http://www.flickr.com/photos/bensutherland/2050055462. Bangladesh suffers from a demographic dilemma. Its tropical climate, availability of fresh water, and productive agricultural land have augmented a high population growth rate. The ever-increasing population is a growing concern. The government has stepped up its support for women’s health, birth control, and family planning services. This is an Islamic country, but practical approaches and common sense in regard to population control have won out over Islamic fundamentalism, which has not always supported family planning. This poor and highly populated country has experienced political problems. Most of the people work in agriculture, while the remaining population is primarily concentrated in the service sector. Small business enterprises have been encouraged by the issuing of microcreditSmall loans extended to people without collateral to assist them in applying their skills to an economic enterprise., or small loans, to assist people in using their skills to earn income. Globalization is evident in Bangladesh. As a result of the availability of cheap labor, sweat shops have been implemented to manufacture clothing for export to the world markets. The country also receives financial remittances from Bangladeshis working overseas in places such as the oil-rich region of the Middle East, which also is predominantly Muslim and is attracting cheap labor for its economic development projects funded by oil revenues. One example of how Bangladesh has been able to acquire materials such as steel is in the recycling of old ships. Shipping companies that have ships that are no longer viable for modern shipping have brought them to the shores of Bangladesh to be stripped down, taken apart, and the materials recycled. The summer monsoons are both a blessing and a curse in Bangladesh. The blessing of the monsoon rains is that they bring fresh water to grow food. The northeast part of Bangladesh receives the highest amount of rainfall, averaging about eighteen feet per year, while the western part of the country averages only about four feet per year. Most of the rain falls during the monsoon season. Bangladesh can grow abundant food crops of rice and grain in the fertile deltas of the Ganges and Brahmaputra Rivers, rivers that ultimately empty into the Bay of Bengal. About 55 percent of the land area is arable and can be used for farming, but flooding causes serious damage to cropland by eroding soil and washing away seeds or crops. Every year, countless people die because of the flooding, which can cover as much as a third of the country. One of the worst flooding events in Bangladesh’s history was experienced in 1998, when river flooding destroyed more than three hundred thousand homes and caused more than one thousand deaths, rendering more than thirty million people homeless. Most parts of Bangladesh are fewer than forty feet above sea level, and the country is vulnerable to major flooding according to various global warming scenarios. Half of the country could be flooded with a three-foot rise in sea level. Storm surges from cyclones killed as many as one hundred fifty thousand people in 1991. In comparison, about two thousand people died when Hurricane Katrina hit New Orleans in 2006. The high death toll from flooding does not receive its due attention from Western news media. Environmental concerns increase with the long-term projections of climate change. If sea level rises or if storms increase, then the low-lying agricultural lands of Bangladesh would suffer even more flooding and devastation. This would decrease the food supply of a growing population. Another environmental problem for Bangladesh is deforestation. Wood is traditionally used for cooking and construction. The needs of a larger population have caused widespread deforestation. Brick and cement have become alternative building materials, and cow dung has become a widely used cooking fuel even though it reduces the fertilizer base for agriculture. Even so, these adaptations have not halted the deforestation problem. The main remaining forests are located along the southern borders with India and Burma (Myanmar) and in the northeast sector. 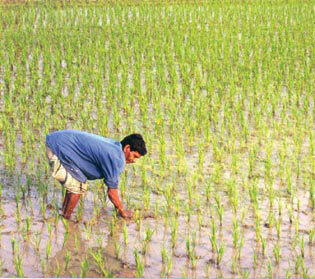 Source: Photo courtesy of US Agency for International Development, http://commons.wikimedia.org/wiki/File:Rice_Field.jpg. Bangladeshis suffer because of widespread water pollution from naturally occurring arsenic that contaminates water wells. The pyrite bedrock underneath much of western Bangladesh has large amounts of arsenic in it. Millions of people drink groundwater contaminated with this arsenic on a daily basis. Arsenic kills people slowly, by building up in their bodies, rotting their fingernails, giving them dark spots and bleeding sores. Arsenic is a slow killer and a carcinogen that increases the risk of skin cancer and tumors inside the body. Villagers in Bangladesh began being affected by these symptoms in the 1970s. In 1993, official tests indicated that up to 95 percent of the wells in one of the villages in the western region were contaminated. The widespread water contamination has also had a social cost. Reports indicate that husbands are sending their disfigured wives back to their families of origin, and some young people are remaining single. Stories are told of people who believe that the health problems are contagious or genetic and can be passed on to children, which causes dilemmas for women who are trying to find a husband. Despite an overall languishing economy, economic success stories in this poor country do exist. The Grameen Bank has been working to empower women in Bangladesh for many years. The bank issues microcredit to people in the form of small loans. These loans do not require collateral. Loans are often issued to impoverished people based on the concept that many of them have abilities that are underutilized and can be transformed into income-earning activities. About 96 percent of these loans are to women, and the average loan is equivalent to about one hundred dollars. Women have proven to be more responsible than men in repaying loans and utilizing the money to earn wealth. The loan recovery rate in Bangladesh is higher than 98 percent.“Grameen Bank—Banking on the Poor,” Grameen Support Group, accessed November 14, 2011, http://www.gdrc.org/icm/grameen-supportgrp.html. Microcredit has energized poor women to use their skills to make and market their products to earn a living. More than five million women have taken out such loans, totaling more than five billion dollars. This program has energized local women to succeed. It has been a model for programs in other developing countries. When Britain’s colonialism ended in South Asia in 1947, the Muslim League was instrumental in creating the united Muslim state with both East Pakistan and West Pakistan under one government. East Pakistan broke away and became the independent country of Bangladesh in 1972. Both Pakistan and Bangladesh have large populations that are increasing rapidly. Both countries have agriculturally based economies. Rural-to-urban shift is occurring at an ever-increasing rate in both countries. Population growth places a heavy tax on natural resources and social services. The political units within Pakistan include four main provinces. Tribal Areas border Afghanistan and are controlled by local leaders. The Northern Areas are disputed with India. Each of the provinces has its own unique physical and human landscapes. Earthquakes are common in Pakistan because the country is located on a tectonic plate boundary. Deforestation and water pollution are two other major environmental concerns. Bangladesh is a low-lying country with the Brahmaputra River, Ganges River, and the Meghna River flowing into the Bay of Bengal. Flooding is a major environmental concern that has devastated the country on a regular basis. What happened to East Pakistan? Why did its name change? Why does Pakistan have a forward capital? Where is it? Where did the capital used to be? Compare the population density of Pakistan, Bangladesh, and the United States. What are the four main provinces of Pakistan? How are they different from each other? How is Bangladesh affected by the summer monsoon? How much rain can it receive annually? What are the main environmental problems in Pakistan? In Bangladesh? What type of government does Pakistan have? What is the law based on? How could both countries address their population growth situation? Who was the first woman prime minister of Pakistan? What happened to her? How has microcredit aided in the economic development of Bangladesh?